I have officially accented into the 6am and beyond club. Not that I have turned into an early bird, but it has been an all-nighter. Brownies – definitely an easy to make and crowd pleasing dessert. 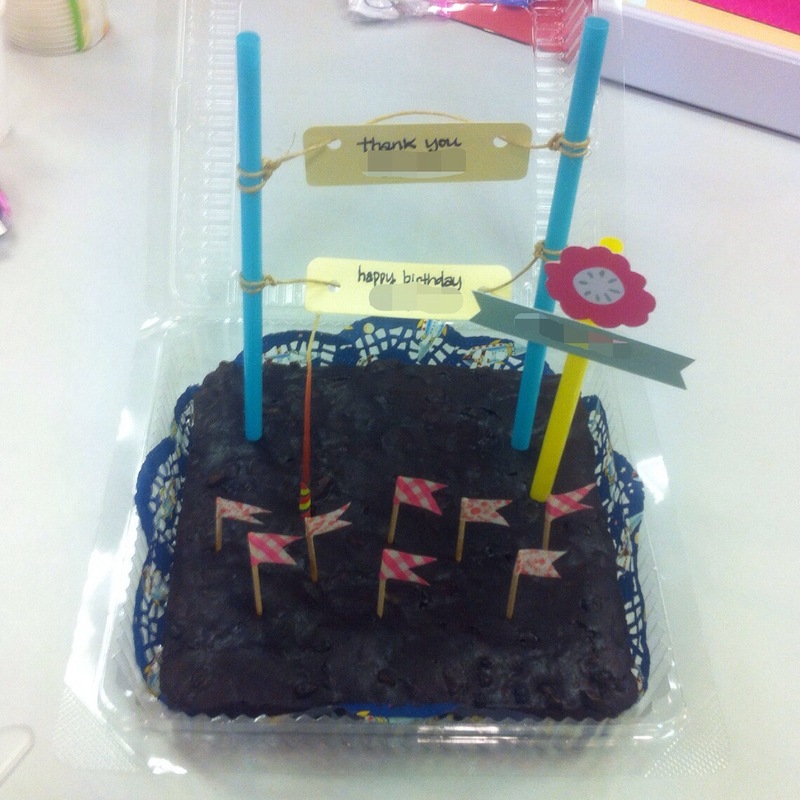 Pretty proud of the deco effort. Not too bad especially since all the flags and tags are made by me. The cutting knife was dressed up as well but I forgot to take a photo of it. Feeling emo for the last week. Probably wrecked hormone, easiest to put the blame there isn’t it. Time of the month came by 5 days earlier. Perhaps early signs of menopause? I don’t know. It’s the Songkran weekend and it’s P’s birthday. I do remember birthdays to a good extend normally. There’s just something soothing about this song/video. Rant for the day – people with email signatures that say “Sent from my iPhone”, “Sent using BlackBerry” … argh!!! Please for goodness sake, just change your email settings and delete those freaking lines. They ain’t no “fashion statement” but “fay-son faux paus”. It was Moon Cake Festival a couple of days ago and mum bought a pomelo. There were about 6 wedges left in the fridge and I decided to make Yam Som-O out if it. The actual “assembling” of the salad took like a minute? The mise-en-place took a bit more time. But nonetheless, it was still easy and delicious. Most recipes for Yam Som-O comes with coconut milk but I like mine without. The sweet-sour-salty-spiceness should be adjusted to your own liking by increasing or decreasing the amount of sugar, calamansi, fish sauce and chilli. Place pomelo in a big bowl, follow by chopped garlic and shallots. Add in calamansi juice, chilli powder, brown sugar, fish sauce and mix well. 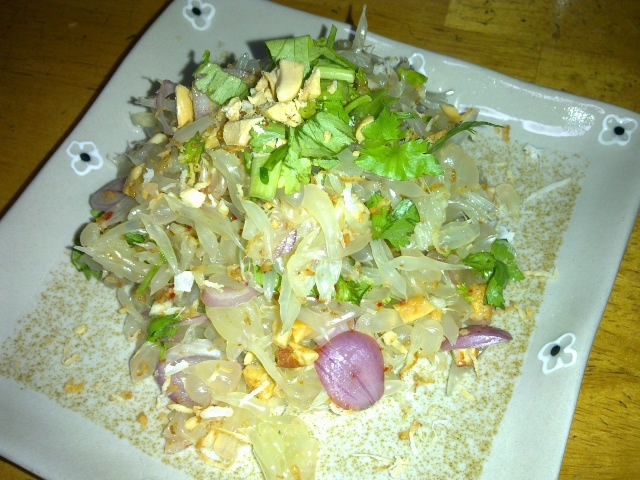 Add in chopped peanuts, toasted coconut, dried shrimps, chopped coriander and toss lightly. Had been @#$%-&^% with work and didn’t have time to “play” with this new blooging hobby of mine. Earlier on, I was attacked by this really BAD craving for sweets. The crappy Mascarpone Carrot Cake from our Hotel’s Pastry Kitchen did not satisfy at all. I want and I need to have a big fat slice of yummilicious cake. Hence … started the task of baking at 30 minutes to midnight. Never mind the fact that I still have to roll in to work by 8:30 am and it is now pass 2:00 am. Do I give 2 hoots? Absolutely NO! I had taken a lot of photos which I had wanted to blog about, but never got about doing it. Since I have now started this, the photos come in handy. Although I have now moved to a monkey island in Indonesia, up till 16 Dec 2007, I was still living on the sunny island of Phuket and hence you might be reading quite of bit of Thai related stuff. I cook and there are many options (cheap as well) to eat out, but sometimes, I am too lazy to do any of that and during times like these, frozen meals come in handy! However, as always, the final product vary a long way from the packaging photo and hence the title of this blog – Advertising vs Reality. 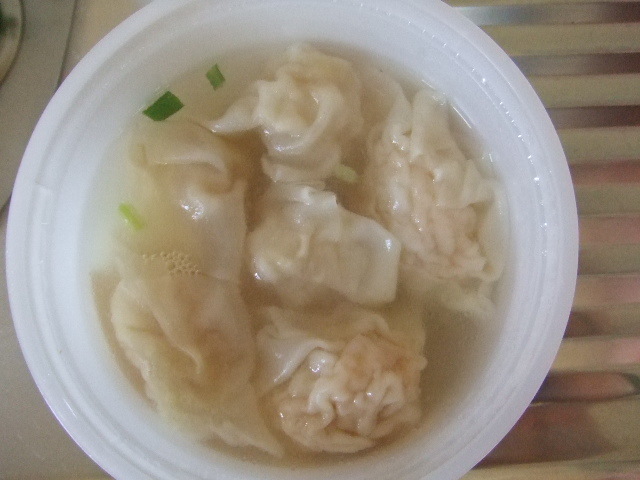 Shrimp Wonton Soup is a very commonly available Thai/Chinese dish. I cannot remember actual cost, but the frozen pack probably cost about THB60. 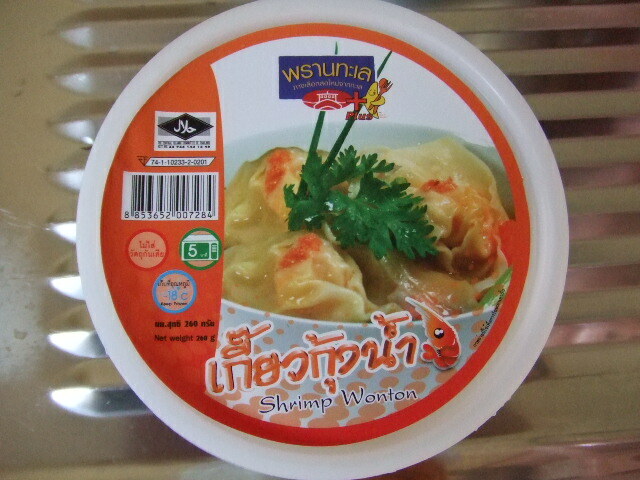 At little food stalls, this dish is available for around THB40 only. So why do I still eat/buy these frozen stuff … don’t ask … probably just laziness. There are more of these comparisons to come; but that’s all for the time being. Enjoy the rest of your weekend.